How does that sentence end? Because it has consistently excellent beer? A number of places do that. They continually innovate and throw out new ideas, while remaining true to a distinctive ethos? Hey there, Parallel 49. It’s a place for beer fans, by beer fans? Even non-IPA fans like their IPA and non-sour fans like their sour? It rewards the experience of going to their brewery? Because last summer, they had the words “Experimental Ale Fermented With Brettanomyces & Wild Yeast Isolated From The Guts Of Wasps” on their tap board, and it intuitively made sense? You could make those claims about many places in Metro Vancouver (the wasp beer excluded). But Brassneck is the only place where the answer is “yes” to virtually every question a beer drinker would have. It does more things to stand out to more people, with a mix of both consistency of quality, and innovation of output, than anyone else. 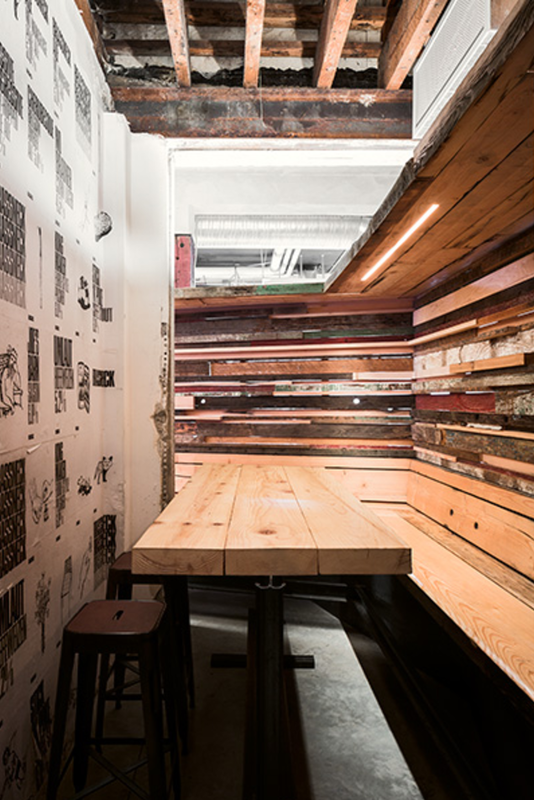 The back nook at Brassneck is the Boardwalk of the Vancouver brewery Monopoly board. The road to becoming the best was in one sense fairly simple: the co-owner of Vancouver’s best beer bar (Nigel Springthorpe of the Alibi Room) and the longtime brewmaster at Vancouver’s best brewpub (Conrad Gmoser of Steamworks) opened in 2013, pushed out an astonishing 20 beers in their first four months, and then Kept. Making. New. Good. Beers. month after month, limiting distribution from bars and not bottling, so that if you want to take it home, you have to lend them a visit. And if you do visit their tasting room, at what is arguably the most convenient location in the city (just two blocks north of Broadway and Main), you’ll have a wonderful time in the narrow wooden space, particularly if you manage to snag the secluded booth in the back. Aside aside from their hopped pale ale (Passive Aggressive) or Pale Ale (Brassneck Ale) which are always on the menu (not that we’re complaining), you’ll have your choice of a constantly changing mix of 6-10 unique beers, none of which are ever duds, and some, like the Changeling or the Magic Beans, are A+ beers for many of us, no questions asked. What more could you want? 11 beers pouring today with some badass brews in the mix. Cannon Fodder IPA Cherry Changeling Stockholm Syndrome #brassneck showing some real diversity. Well, a few things, if we’re being picky. A slightly larger tasting room so you don’t have to wait for 45 minutes on a weekend would be nice. If they’re never going to distribute to liquor stores, an on-site bottling station would be neat. And their offerings, while diverse, rely a little heavily on tweaking various ales and saisons 10 degrees to the right or left: while Brassneck does plenty of experimenting, you might be disappointed with how little of that involves porters or darker beers. But these are tiny quibbles. Every single person who ranked Brassneck put it in their top three, because there’s so much to like, and has so few weaknesses, and no other brewery in Metro Vancouver can say that. Except Four Winds and Strange Fellows. If you argue that either of them are better, you’re not necessarily wrong; it’s just a question of taste. Or more accurately, it’s a question of style: Brassneck is just a little more wooly around the edges, a little more willing to mix things up, a little more prodigious, and with a tasting room that’s a little more interesting, that even though Four Winds has the slight edge on beer quality, Brassneck wins on overall points. At least, that’s our argument. And if you’ve made it all the way through this list, chances are you have your own.